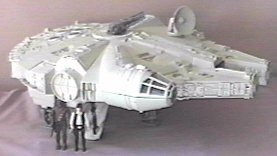 "Detailed replica of the speedy space vehicle piloted by HAN SOLO and CHEWBACCA. 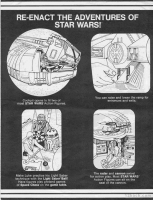 Push-button activates exciting "Battle Alert" sound when enemy TIE FIGHTERS are near. 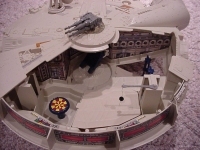 Cockpit canopy flips open to fit two Action Figures. 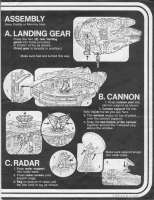 Radar disk swivels manually, bottom has retractable landing skids, and entrance ramp folds up. 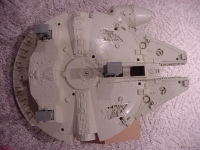 Desk panel lifts off for interior play environment and Action Figure sits in gun turret chair. Gun "clicks" and chair turns when you spin the gun. Secret floor panel lifts to reveal hiding compartment for rebels. Simulated game table lets you imagine CHEWIE and C-3PO playing "Space Chess". 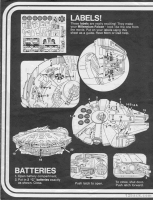 BEN KENOBI can give LUKE SKYWALKER LIGHT SABER lessons with hanging "remote FORCE ball". 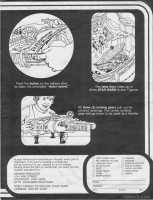 This excerpt was the first introduction many of us had to what would become one of the most popular vehicle/playsets in the Star Wars line. 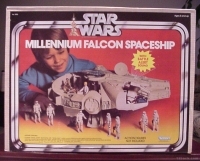 The Falcon was released a few months before Christmas '79 and was the highlight of that year for many kids. 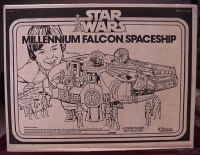 Kenner designed the Falcon to incorporate all movie-features seen in Star Wars as play features on the toy. 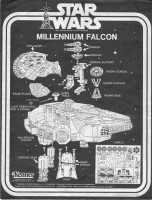 The design worked well and proved so popular that the Falcon was the only 3 3/4" figure accessory to be sold in the same format throughout Star Wars, ESB, and Jedi. Secret compartment under "false floor." When not in use, the false floor fits into retaining tabs on the inside of the rear access cover. 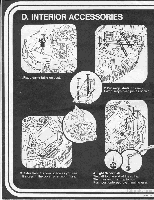 Radar dish rotates and elevates. Opening canopy with room in the cockpit for two figures. Gun assembly : seat, support, glass window, quad cannon (2 halves). Jedi practice ball and support arm. 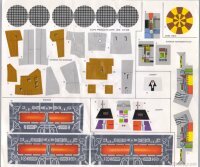 Cargo ramp and (2) struts.